As readers of this column know, one of my favorite statements is, “Let’s look at the data.” So when I read in USDA’s recent report, Food and Agricultural Policy – Taking Stock for the New Century, that in the United States, “domestic food needs grow only at the same slow pace as the population expands,” I decided to look up the data and see how well these two statistics track each other. Likewise when I read, “we continue to see growth in exports of traditional commodities,” I knew I had to take a fresh look at the data because I have been saying just the opposite in this column. To check on the relationship between population growth and growth in domestic demand I decided to look at the sum of total grains and total seeds. This aggregate covers all of the major crops and is representative of the program crops that are a major focus of farm bill legislation. I adjusted these numbers to account for the amount of grains and seeds that are fed to livestock and poultry that are sold into the export market. For exports of “traditional commodities” I again used the sum of total grains and seeds and adjusted the numbers to account for grains and seeds that are fed to export livestock and poultry. I then indexed the numbers to 1979=1.0 and graphed the results (Fig. 1). 1979 was the year with the highest level of exports for the traditional commodities. Figure 1. 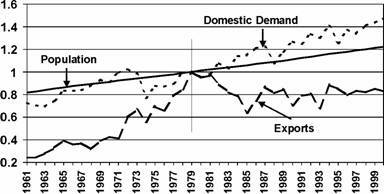 Indexed growth in U.S. population, domestic demand for grains and seeds, and exports of grains and seeds, 1961-2000. Domestic demand and exports have been adjusted to account for livestock and poultry that are sold into export markets. Indexed: 1979=1.0. Figure 1 shows that the past forty years fall into two distinct periods, 1961-1979 and 1980-2000. During the earlier period total grains and seeds exports increased by over 400 percent providing a significant boost to crop agriculture in those years. While not as dramatic as exports, domestic demand for total grains and seeds increased by 33 percent. The increase in domestic demand is greater than the 22 percent increase in population for that same time period. Despite a series of federal agricultural policies in the 80s and 90s that have promoted exports, agricultural exports for the last twenty years have tapered off from their 1979-1981 highs. In fact they have hovered about 20 percent below the 1979 record. Domestic demand, on the other hand, increased by 47 percent during the same time period, while population increased by 22 percent. Much of the growth in domestic demand beyond the rate of population growth may be due to increased industrial demand. By using the term “domestic food” needs, the language in the report may be technically correct. But from the context, it seems that the real comparison being made is between domestic demand and export demand. When total demand is considered, domestic demand for all grains and seeds has increased faster than population and faster than export demand over the last twenty years. During the earlier time period, exports clearly were the engine that drove the growth in demand for traditional commodities. But that has not been true for the last twenty years. We can hope for “growth in exports of traditional commodities,” but that hope has not delivered during the last two decades. I am concerned that, once again, agricultural policy could be developed around the way some believe that agricultural markets SHOULD function. As Congress works on a new farm bill, specifically the commodity sections that are of particular concern to crop agriculture, I believe it is important that we keep focused on how agriculture ACTUALLY performs in the marketplace. If we don’t, we may again see our expectations dashed.